While you may be focused on developing your business model, creating and launching a viable product or service solution for the marketplace, never forget to consider the basics of business as the foundation for your success. One of these basic processes is bookkeeping. While you may not have many complex transactions or an extensive amount of capital to track on a balance sheet, it is critical to develop the financial management framework that will eventually be necessary. There’s saving money, and then there’s saving money. One thing you should invest in is any aspect of your bookkeeping that can be automated rather than falling back on manual methods like ledger books, a checkbook, and graph paper. Starting out in a manual frame of mind with your financial records will only increase the time it takes to finish, plus lead to greater human error. Instead, start researching software or cloud-based systems where you can automate the entire process, which will also help to handle future tasks, such as payroll and payroll reports, tax payments, employment benefits, and more. Accurate financial records tell you a lot, so it is vital that you start learning how to keep good records even before you start. Accurate records come from regular and consistent data entry of financial information, including what you make and what you spend. Along these lines, you will need to make sure you keep and track all receipts, especially when you are a small business owner or entrepreneur with a start-up who may be using your personal account to fund the business. You can begin with record keeping almost as soon as your start-up business involves money you or others invested, which is pretty much the first day you write a check, charge something, or pay cash for anything related to your start-up. Having good records means you can get a clear picture of sales and expenses to make changes before any of these problems adversely impact your business. It also tells you if you even have a viable business or not. If you are continuing to look for funding, starting to keep accurate records now can help to obtain financing because any investor will want to see current and future projected financial statements, such as an income statement, cash flow statement, and balance sheet. I put together a guide to invoicing that should help you keep track of all your bills as well as making sure that all your books are in order. As you develop your start-up, you will need to decide on its legal structure. Will it be a sole proprietorship, LLC, or partnership so that you claim business income as part of your personal tax return? Or, will your start-up become a corporation in which it becomes a separate tax entity and will require a corporate tax filing and corporate tax obligations. Consider how this tax obligation will impact your bookkeeping knowledge and records as well as your available money that may need to go toward these tax obligations. And, if you are selling a product, you may also have to know how to report sales tax. This mysterious question is an important decision to be made. You will either use a cash or accrual method for keeping your financial records. While the cash method requires that you recognize revenue and expenses at the time they are received or paid, the accrual method only recognizes these when the transaction occurs even if there has not been a receipt or payment made. This second method requires that you continually track receivables and payables within your bookkeeping records. If your business has revenues that are less than $5 million, you can use the cash method, but if more than that you must use the accrual method. Even if you are just starting off with paying yourself or you have a very small team, getting to know a payroll system and deciding how to implement is important to prepare in advance. While you do this, you can also consider how you will grow your team and whether they will be employees or independent contractors. If you plan on making them employees, you will definitely need to understand payroll schedules in order to withhold taxes from paychecks. For independent contractors, you will still need to track what you pay them and then file a 1099 for each one where you have paid them over $600 in a year. In thinking about this and how complex payroll can get, remember that there is software as well as payroll outsource companies that can help you with all types of bookkeeping activities related to this part of your start-up. Think about what type of financial expertise you might want to procure. This could be a part-time, or outsourced, bookkeeper who is either local or who works virtually. As you grow and are in need of more complex bookkeeping services you will need to have someone in-house or use an accountant. It does not hurt to start researching or networking for financial expertise with bookkeeping and financial records. With so many aspects of your business to handle, you want to make sure you find a trustworthy, knowledgeable, and skilled financial person who can help you keep good records, stay compliant, and provide insights into what the books are saying about the health of your start-up. 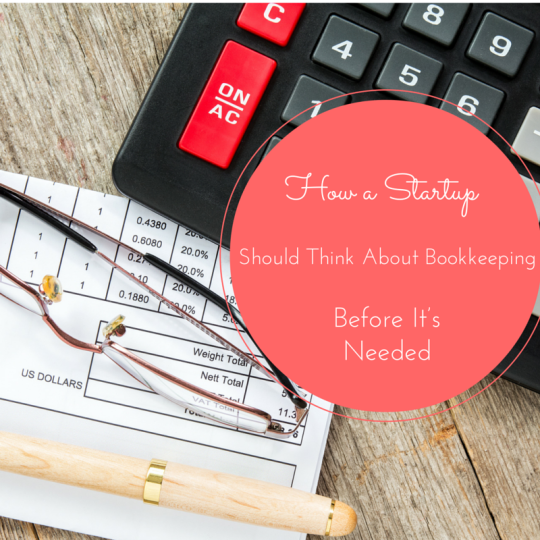 Establishing a sound financial process for bookkeeping in advance will provide you with critical information that will help you make decisions about your start-up along the way. This data includes whether you are actually making money or not so you can provide your investors with reports on how the business is doing and pinpoint areas where changes may be made. Having automated processes, good records, knowledge of compliance and taxes, a solid payroll system, and a team of financial talent will be a solid framework to help scale up your company’s financial reporting. Best known as an Entrepreneur and Connector. John Rampton was recently named #3 on Top 50 Online Influencers in the World by Entrepreneur Magazine as well as a blogging expert by Forbes. Awarded Top 10 Most Influential PPC Experts in the World for the past 3 years. He is the Founder and CEO of Due.com.